Lucca’s Trattoria is inspired after a visit to Lucca, Italy. Lucca is charming and idyllic, with its 500-year-old city walls lovingly preserved and transformed into a lush park for the locals and visitors. Being located in Tuscany, the food is made from fresh produce and of a rustic and unpretentious style. 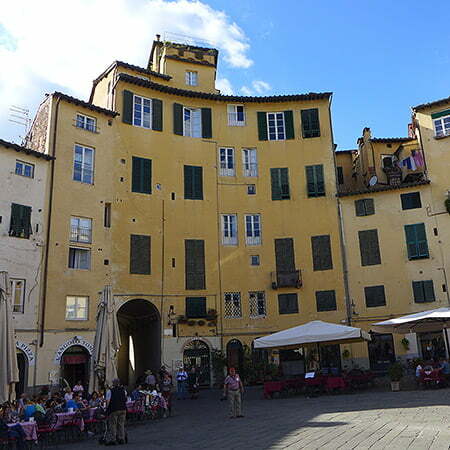 It is on these historical city walls that the Owner and Chef discussed and decided upon setting up Lucca’s Trattoria. Enjoy Cucina alla casalinga (home cooking) and hand made pasta at Lucca’s Trattoria. We serve several signature Tuscan dishes and our menu creations are based on what we ourselves will eat daily, using premium ingredients mostly from Italy. A generous selection of pizza, pasta, lasagne and ravioli are on-hand to whet your appetite. We believe in cooking our food from scratch, using natural ingredients. For example, our pizza dough is made using special grade flour imported from Italy to give you that perfect match of texture and taste. Our ravioli is hand made within our store. All these can be observed in our open kitchen concept, including our Pasta Making corner, where we make fresh pasta on a solid Oak table top. Over at our Pizza creation kitchen, our Chefs hand-open the pizza doughs instead of using machines. Similarly, gelato is made freshly within the store and not from powder mixes.